Now that we had all of the NON-perishables packed on the boat, it was time to make the last final run to Publix for the perishables. And, I say “final” because we took quite a beating at Publix in the week before our trip. We had made about three trips already for non-perishables and our freezer food, but this last one was a mighty trip. I thought we might perish! The receipt was almost as long as my legs. Yes, legs. Plural. One stacked on top of the other. A particularly supple specialty item on our list was, of course, none other than WINE. I can tell you many a-cabinet and cubby on the Plaintiff’s Rest are chalk full of wine. Our bottles had over-flowed the liquor cabinet and spilled into the cubbies in the table. We had also sampled many boxed wines to try and find a good one that we liked for cruising, but I’ll tell you – we struggled. I don’t really think we’re wine snobs in any sense of the term, we love a good $8.99 value wine just as much as the next bloke, but it just seemed the particular $8.99’s we liked came in glass bottles. 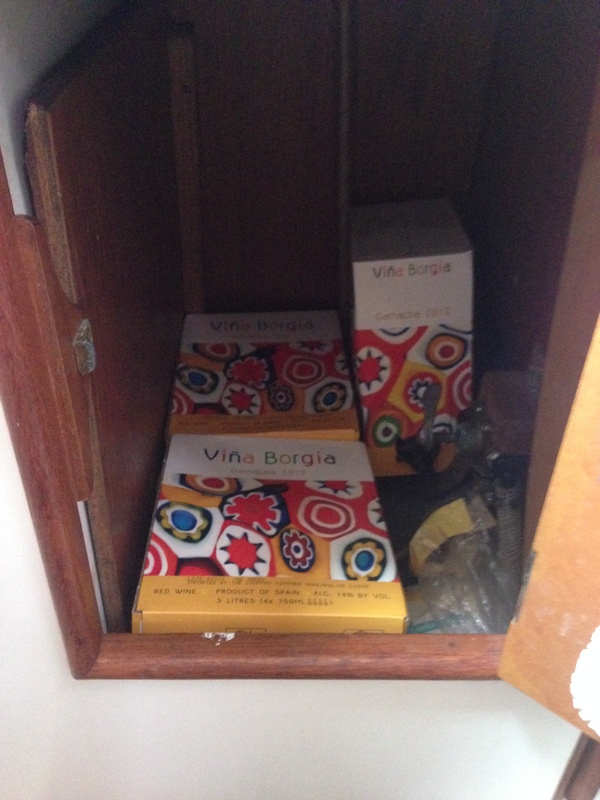 Until … we tried this boxed granache – Vina Borgia from the Aragon Wine Market. It’s a great table red that pairs well with food but is easy for sipping on its own. Just a versatile, filling wine that has worked really well for us. So, three it was, and we shoved them under the sink. If any of you all have come across a great boxed wine, please, by all means, let us hear about it! So, the ever-dreaded perishables trip to Publix was done. That was the last item on the list. We were on the eve of the trip. Now it was just watching the weather and making sure tomorrow, Thursday, was still a good day to jump out into the Gulf. We saw a storm brewing in Arkansas that we had been keeping an eye on. It was heading east and set to hit Pensacola on Saturday. We knew if we were going to head out tomorrow, we had to make way east fast. The easter the faster the better! Every time Phillip checked the weather, I would squinch my eyes tight in my best ‘make a wish’ face and hope he wouldn’t say we were going to have to push the trip back a week. I knew it was a stupid wish. We wanted to be careful. We wanted to leave when it was safe. But, we also wanted to GO! I opened one eye just a crack as he checked it one last time before we went to bed that night and hoped for the best. This entry was posted in Boat Projects, Cruise to the Keys 2014, Provisioning and tagged boat stowage, cruising the florida keys, meals for cruising, packing a sailboat, provisioning, publix. Bookmark the permalink.